Selling to Doctors. If you’re a medical sales representative or pharmaceutical sales representative, doctors may be one of your touch points. Is selling to doctors difficult? It depends. In this short video, Mace Horoff emphasizes some of the key points about selling to doctors (and other HCPs as well) so you can have better sales calls and generate better sales outcome. 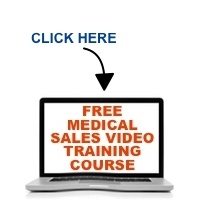 Tell me your biggest medical sales challenge. I’ll tell you the ONE THING you should do NEXT, customized specifically for you, absolutely FREE.